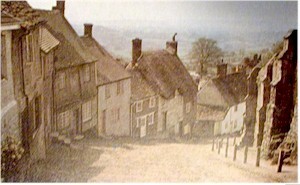 Shaftesbury is Dorset's only hill top town built on the edge of a plateau, giving fine views over Blackmoor Vale. Shaftsbury became a place of pilgrimage and Royal Patronage following King Alfred's foundation of an abbey on its airy hilltop in AD888 and interment of Edward the Martyr's body there in AD980. The town has some excellent gray green, 18th century stone houses, and the steep, cobbled Gold Hill is buttressed on one side and terraced like an Italian hill town on the other.